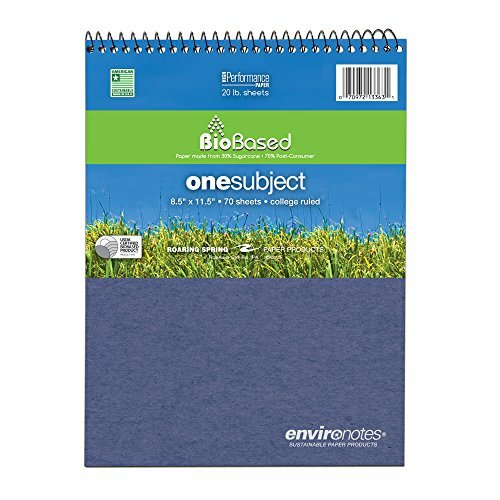 One subject "Environotes" wirebound notebook, top open. Smooth, white, 20# writing paper is college ruled with a red margin line, and is perforated across the top. Paper is produced from 30% sugarcane post-agricultural fiber and 70% post-consumer content. High-Performance 20# sheet allows writing on both sides. Covers are produced from high-recycled content 25 point Reprise board, and are packed in assorted colors. The back cover is an extra heavy-duty 80 pt grey chipboard, which allows this book to be used like a clipboard. The book is wired across the top-great for left-handers. Wire ends are coil-locked for snag-proof performance. Each book is 8.5" x 11.5" and contains 70 sheets of writing paper. Wirebound securely to keep notebook contents intact. White paper produced from sustainable sugarcane fiber. Available in four attractive colors. Top Opening "Flipper". Pad Type: Notebook. Sheet Size: 8 1/2" x 11". Ruling: College.